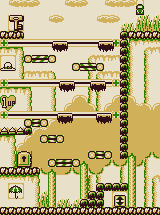 Stage 2-11 is the eleventh stage of the Game Boy version of Donkey Kong. The level has many Conveyor Belts and moving platforms. Mario starts off on the platform with the door where he must go right up some little "stairs" over to the ladder block to activate the ladder then connect it to the upper platform then climb up it before the ladder disappears. Once up there Mario must wait for some moving platforms to be in the right place so he can jump onto it then ride it over to the platform with the key. He must then grab the key and carefully go down using the moving platforms and the conveyor belts. Mario can get a 1 UP Heart by riding the lowest set of moving platforms to the left, making sure he doesn't fall onto the Spikes. Mario must go down to some sets of conveyor belts to reach the door. Hat: In midair above the 1 UP Heart. Parasol: On the ground below the platform with the door. Bag: On the platform where the Ladder must be placed. This page was last edited on September 7, 2018, at 02:50.